I have been tinkering with visual learning tools, like mind maps and flow charts, because I find that it is not only more interesting to learn stuff this way, but also, I have better retention of stuff when I learn them like this. Click on pic to embiggen! 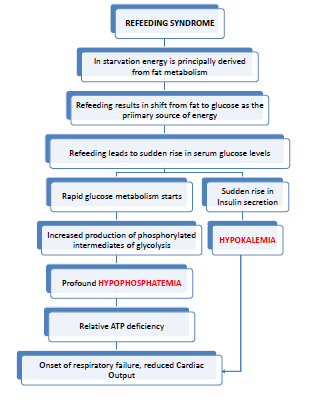 Refeeding syndrome is one of the topics which was taught to us in general surgery and I retrieved this flow chart from my notes. Hopefully this is correct, because I had to sort out the relevant sections from a mass of doodles which predominate my note taking efforts (mostly so that I do not fall asleep in the middle of the class). So, from the next post onwards, expect more detailed and referenced flowcharts which do not primarily depend on notes which are interspersed by blog header design doodles. And if you spot any errors in this one, please let me know! Tags: Flow Charts, Medical School, Medical Student, MindMaps, PostADay2011, Surgery. Bookmark the permalink.